KAMENSK-SHAKHTINSKY, Russia -- A Russian aid convoy destined for rebel-held territory in eastern Ukraine resumed its disputed southward journey on Thursday, in apparent defiance of demands by the government in Kiev that the shipment be stopped. 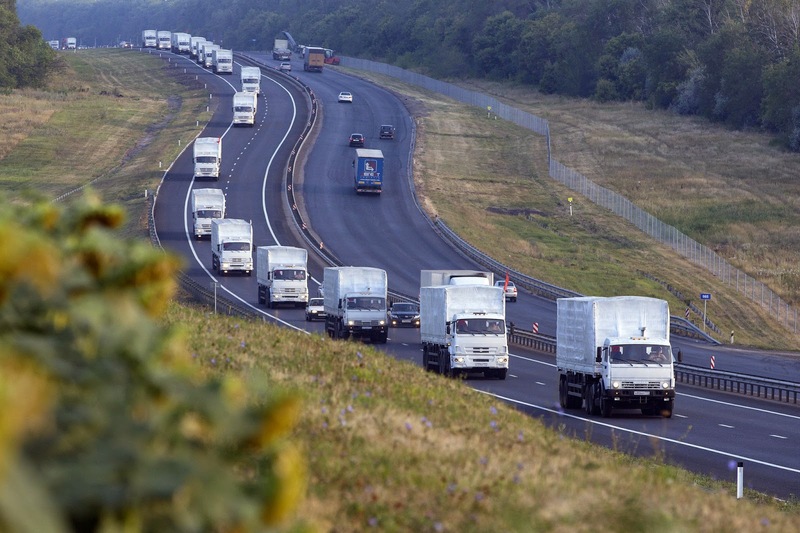 Moving at a steady 50 miles per hour, more than 200 commercial trucks and some army trucks with white tarpaulins set out before daybreak from a military base in the city of Voronezh, where the convoy had halted for more than a day after protests from Kiev. Its progress coincided with what seemed like conciliatory remarks on Thursday by President Vladimir V. Putin in a speech to federal lawmakers in Yalta, Crimea. “We will do everything we can to help secure an end to this conflict as soon as possible, so that there will be no more bloodshed in Ukraine,” Putin was quoted by the Interfax news agency as saying. Putin also referred to what he called the “large-scale humanitarian catastrophe running riot in the southeast” of Ukraine. The president said Russia did not want to sever its contacts with the rest of the world but refused to be treated with contempt, echoing remarks in March when he announced the annexation of Crimea, accusing the world of ignoring or denigrating the country since the collapse of the Soviet Union. Putin has previously made conciliatory remarks about Ukraine, only to continue what the Ukrainian government in Kiev and its Western allies have described as a steady supply of men and arms to the separatists to destabilize the country. As usual, Russia has denied those claims. Diplomats following negotiations between Russia and Ukraine from Moscow about the fate of Russia’s aid convoy said that the two sides were approaching a solution, but the dispute had not been completely settled and there was as yet no timetable. The convoy itself was headed to the border post at the Ukrainian town of Izvarino, just southeast of the beleaguered eastern Ukrainian city of Luhansk, diplomats said. A New York Times reporter following the long line of vehicles said they had turned off the main north-south highway in Russia toward that crossing, which is not under Ukrainian government control. Initially the two sides had agreed that the goods would cross farther north in a location fully under the control of Ukraine. But the apparent change of destination, said one diplomat, speaking anonymously because he was not authorized to comment publicly, meant that the previous agreement would have to be reworked. That is only one of the outstanding issues, diplomats said. It appeared that the Russian trucks would be allowed to cross into Ukraine, for example, but it was not clear who would drive them and where exactly they would go in or around Luhansk. Russia has said the convoy’s cargo includes 340 tons of canned meats, 649 tons of water, and more than 62 tons of baby food. Moscow dispatched the trucks early on Tuesday, saying the purpose was to counter the threat of a humanitarian crisis in eastern Ukraine as government forces advanced. In Luhansk, isolated by heavy shelling, for example, basic utilities like running water and electricity have been cut off for more than a week. But even as the convoy moved south again, there were indications that the battle on the ground for control of eastern Ukraine was continuing on Thursday. Reuters quoted an unidentified witness as saying artillery shells hit close to the center of rebel-held Donetsk for the first time. At least two further blasts rocked areas nearby after the whistling sound of incoming shells. On Wednesday, the office of President Petro O. Poroshenko of Ukraine said it would allow the trucks to cross after inspections by Ukrainian officials and monitors from the Organization for Security and Cooperation in Europe. Colonel Andriy Lysenko, a Ukrainian military spokesman, said on Thursday that Kiev had no precise information on the current whereabouts of the Russian aid convoy or where it might try to enter Ukraine. He warned that Ukraine would use “all forces available” to block the Russian trucks if they tried to enter Ukrainian territory without being checked first by border guards and representatives of the International Committee of the Red Cross. “This convoy has to be checked to see what cargo it is carrying. This has to be controlled by Ukrainian border guards,” Mr. Lysenko told a news conference in Kiev. He also said that Ukraine was sending its own aid convoys to Luhansk, much of which is under control of pro-Russian rebels. He did not provide details of the location or contents of the government’s convoys, but said Ukrainian aid would be handed over to Red Cross officials for distribution to needy citizens. As the Russian convoy moved south, many of the vehicles were adorned with flags including the St. George crest of Moscow, while others displayed a red cross on a white background. Most of the trucks had red numbers on the front windshield and a Times reporter saw numbers up to 258. The highway passed through parched fields of sunflowers and small stands stocked with watermelons and tomatoes. The convoy has intensified a standoff between Moscow and the authorities in Kiev, who remain deeply suspicious about its mission. The Russian government has declined to specify its destination but insisted that the operation was still under the umbrella of the Red Cross, despite statements to the contrary from the organization. “It is moving in the territory of the Russian Federation; it is still moving,” Dmitri S. Peskov, the spokesman for President Vladimir V. Putin, told Russian reporters. The convoy’s halting progress toward Ukraine coincides with efforts by government forces there to force the pro-Russian separatists to retreat into Donetsk and Luhansk, the two major cities under rebel control in the east of the country.